Great selections & pertinent too, thanks for enriching my (day after) Workd Poetry Day. Thanks Tony! I was going to include Melbourne Journal too—had a great fragment picked out—but I think that one warrants a stand alone review. Glad you like it – see if you can get his US published “Beginnings” a brilliant poetic collection of essays. If not there’s a shop here in Melbourne that will surely have a copy!!! I definitely hope to hit a good bookshop while I’m there, with a list of Aussie titles. I did bookmark “Beginnings” at Book Depository, but I’ll likely wait. I have a lot to read and review in the next month as it is right now! 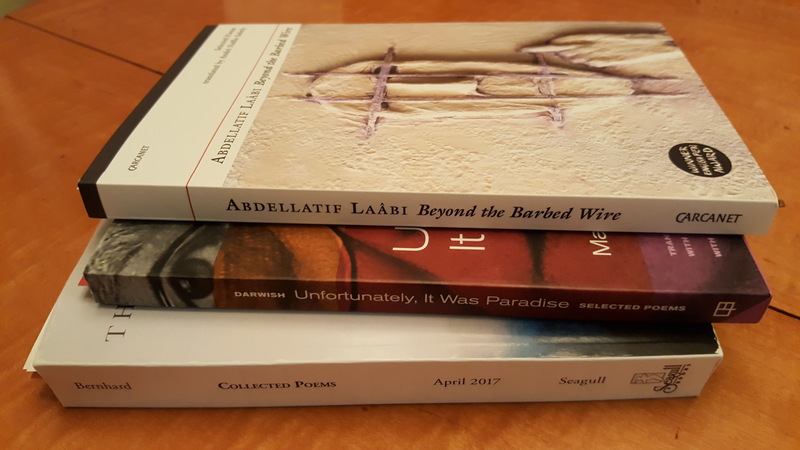 Red Kangaroo books in Alice Springs – full of Australian stuff (less literature but some) & Collected Works in Melbourne (world poetry & literature in translation), both iconic in their own ways. Thank you for sharing these – some wonderful selections! Thanks for sharing these! I especially like the first one. Happy world poetry day! Thank you Stefanie. The first piece is the final stanza of a longer poem. Mahmoud Darwish is just amazing. I have read the first of his essay/memoir collections and have the other two. The poetry collection was purchased to complement my reading, but I will probably collect all of his individual collections at some point. Thank you for well chosen excerpts. I enjoyed them very much. Thanks Kitt. I find an increasing interest in poetry these days. It speaks to so many emotions. That it does. About time for me to develop the skill of writing poetry. Often it’s the only way I can say something. Some truths lend themselves to poetry.